Updated voice assistant makes the jump from Google's Pixel devices. Google Assistant, the voice controlled assistant that has previously been exclusive to the Google Pixel phone, will start rolling out to more handsets from this week. While it hasn't detailed specifics, Google states that "eligible devices" running Android 6.0 Marshmallow and 7.0 Nougat will get an OTA update activating the assistant. According to Google "the Google Assistant will begin rolling out this week to English users in the U.S., followed by English in Australia, Canada and the United Kingdom, as well as German speakers in Germany. We’ll continue to add more languages over the coming year." With "hundreds of millions of users" getting the tool with the update, anyone with a recent-decent Android phone should be getting the treat shortly. 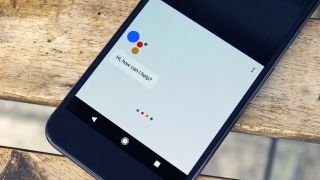 Google Assistant is an overhaul for Google's existing voice-activated phone helper, replacing some of the functions that "Now on Tap" currently offers Android users. The biggest addition is smart home control – Google Assistant can interface with Internet of Things products, letting you speak to your phone to control everything from a thermostat to a lightbulb. It's also more convenient and simpler to use, too. Linking web searches, apps and user data together through its "conversational" command prompts, Google Assistant can be switched on with an easy long-press of the home button. No more hunting around for a microphone button on your homescreen.